What does an American fridge manufacturer and a small English car manufacturer have in common? The Nash Metropolitan of course. What started out as a design exercise to explore what a second car might look like for a newly wealthy American marketplace created the world's first mini car. Originally intended as 50s housewife’s shopping cart, it strangely didn’t come with a boot. Picture your high heeled, beehived, Ray Ban clad 1950's housewife staggering out of a Safeways or Woolworths fully loaded with shopping bags fumbling around with folding seats in order to stow shopping behind them – yeah it's a comical image for sure. With US production lines set-up to produce somewhat larger machinery, the Nash-Kelvinator Corporation realised the cost involved in retooling to produce the little beast would be huge. So they cast around for a European producer for the Metropolitan and eventually Austin was signed up for the project and the rest is history. The performance wasn't bad for the time, and even with Austin A40 mechanicals the Metropolitan took half the time to reach 60 miles an hour as the car that was to ultimately out sell it – the VW Beetle. The car has built a big following over time and owners have included Bridget Fonda, Steve Jobs, Paul Newman, Elvis Presley and, perhaps unsurprisingly, Weird Al Yankovic. 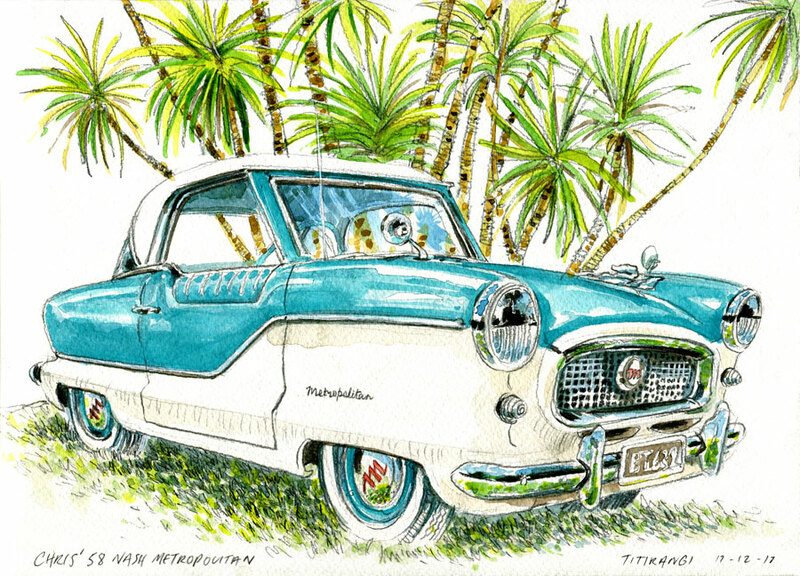 Bumping into a Nash Metropolitan in the flesh today is a delight and Chris Thompson's immaculate example is no exception. You can't help but stop and try to take it all in, from the quirky proportion – European in size, yet American in styling, to the glossy two-tone paint, the low-cut wheel arches, that funky recessed door (is it designed to rest the elbow whilst adjusting those Ray Bans mentioned earlier?) and of course acres of chrome. Sketching it for an hour or so out in Titirangi with a lush backdrop of cabbage trees was a lot of fun too. Thanks Chris. So cool Murray, love the colours too. Damn, you're good at this!